Is the CFA level 2 curve bending in your direction? Although there are around 95,000 candidates giving the level 1 CFA exam each year, only 40-50% of them pass and appear for the second level. 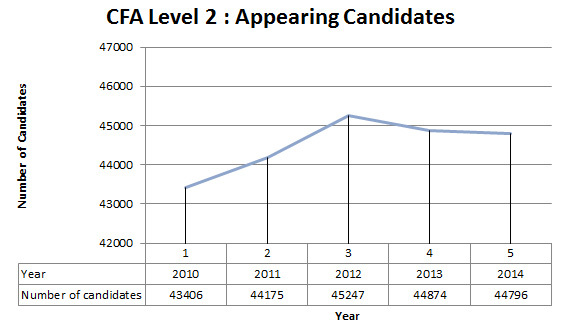 Below is a table depicting the number of CFA level 2 exam candidates for the past five years. On an approximation we can take 45,000 students giving the CFA level 2 exams each year. The year 2012 shows a sharp slope portraying a drastic increase in the number of exam takers. The awareness of the program has brought about high CFA exam takers. 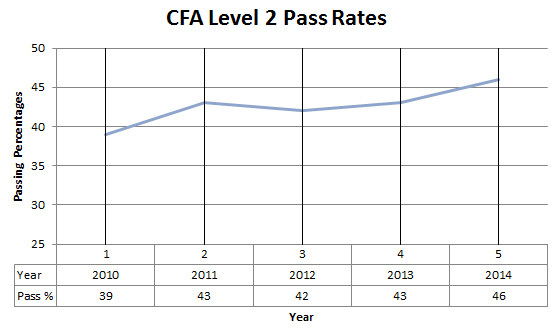 The level of difficulty is supposed to increase at each level, but in the case of CFA we see that the pass rate is higher than the Level 1 exams. This may be due to devotion and motivation of candidates. The exams held in 2014 have shown a great pass rate of 46%, highest in the five years. This shows improvement and determination of the candidates to acquire the certifications as soon as possible. Although the pass rate has fallen really low since the olden times but one needs to compare the number of exam takers as well. The curve is showing an upward trend moving from 42 to 43 and then to 46 per cent which clearly depicts improvement and the scope for it. You need to prepare well for the CFA level 2 exams and to do so you should get training from the best training providers. For more information visit CFA and its course and some tricks that will help you prepare for your CFA exams. For help and query, mail us at help@edupristine.com.